Take the TB3p with you to cover an area temporarily. Size is a crucial factor when setting up indoor coverage i.e. radio coverage in metro tunnels, shopping malls, or basements. The TB3p offers the same powerful features as its bigger brothers TB3, TB3S, and TB3c — from load-directed roaming to air-interface encryption, from Type 1 Handover to base station fallback. 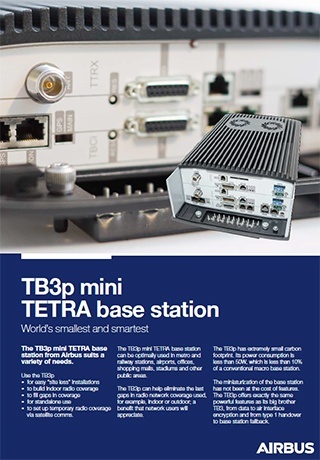 Choose any number of any TB3-series base stations for your network. They all deliver the same features.